Girodisc is a Braking Technology Company dedicated to developing the best quality high performance braking components and solutions. The primary purpose of the Girodisc system is to reduce unsprung and overall vehicle weight. The secondary purpose is to increase the ventilation and cooling capacity of the brake disc while retaining it's original dimensions. This is accomplished by using two-piece disc construction. The central “hat” section of the disc is made from 6061-T6 aircraft specification aluminum. 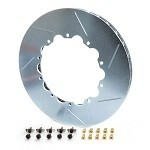 The disc is made from cast iron, to the same specification and material as used by professional racing organizations. It is a curved vane design, developed in racing to act as a centrifugal pump to force cooling air through the disc. The rotor and hat have a floating mount system, which utilizes high strength alloy steel drive pins, manufactured by Girodisc to our own specifications and cadmium plated for a long lasting corrosion resistance. These pins take the load from braking actions while maintaining the axial and radial float between the hat and disc. The pins are secured by grade 12 cap screws with hardened washers. In order to keep the rotors from making noise when cold, the pins are mounted with anti-noise spring clips on the rotor side which allow the rotor to grow with heat expansion but eliminate the rattle and noise associated with floating rotors. This float also allows the rotor to self center between the pads. These rotors will also bolt onto non Z51 C6's and all C5's with the use of the Z51 caliper brackets which can be purchased through the dealer. No modifications are necessary. The disc will bolt directly to the car and work with OE calipers perfectly.